Being from Pennsylvania, Hershey is a staple here. Yes I have been lucky enough to visit Hershey PA. Chocolate Town USA is a great place to visit, you can smell the chocolate in the air, it is true and it is magnificent. 1. Heat oven to 375°F. Remove wrappers from candies. Line small muffin cups (1-3/4 inches in diameter) with paper bake cups. 2. Beat butter, brown sugar, granulated sugar, peanut butter, egg and vanilla until light and fluffy in large bowl. Stir together flour, baking soda and salt; add to butter mixture, beating until well blended. Shape dough into 1-inch balls; place one in each prepared muffin cup. Do not flatten. 3. Bake 10 to 12 minutes until puffed and lightly browned; remove from oven. 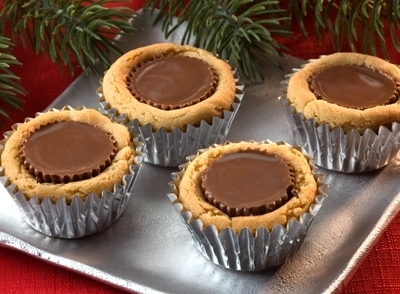 Immediately press peanut butter cup or piece onto each cookie. Cool completely in muffin pan. About 3-1/2 dozen cookies. 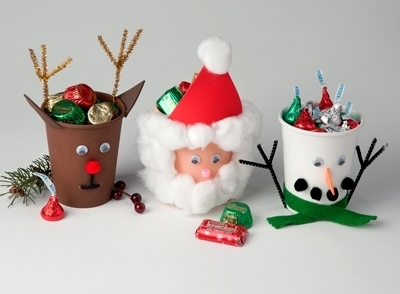 I loved the Celebrate with Hershey’s site, and I came up with so many great ideas for our holiday party this year. Hershey’s is the best chocolate ever in my opinion, and we have always loved using the specially marked holiday pack for stocking stuffers. There is nothing like getting a great Hershey’s chocolate item (or two) in your stocking Christmas morning… Opening it up right away and tasting the wonderful candy, sure it may be 8am, but it is Christmas so it is ok. Hershey has a great variety of items for the holidays, so all of the candy lovers are covered, a peanut butter fan, well tuck some reeses in the stocking. A chocolate fan? Well wouldn’t they love a Hershey chocolate snowman in their stocking, I know I sure would. This Hershey chocolate would also make great gifts for teachers, neighbors and whoever loves chocolate. 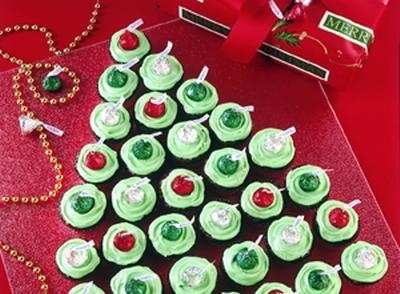 These treats are wonderful, make sure to pick some up for the holidays, they will look great in a stocking or in your candy dish for your holiday party. 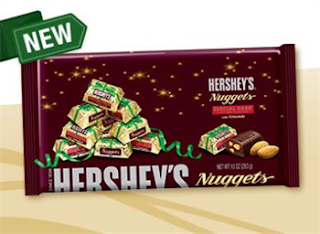 You can find Hershey's holiday candies at grocery stores. Susan S. Disclosure: The reviews and or opinions on this blog are my own opinions . I received candy to review. No monitory compensation was received. I was not required to write a positive review. Your experience may differ. The opinions I have expressed are my own I am disclosing this in accordance with the Federal Trade Commissions 16 CFR Part 255: Guides Concerning the Use of Endorsement and Testimonials in Advertising . I like the original Hershey Kiss. My favorite Hershey's candy is probably the blue symphony bar! The hard to find coconut m and ms are my favorite! I actually prefer Hugs to Kisses. I would choose the REESE'S Peanut Butter Cups. Hershey's Special Dark! I love them! I like Reese's peanut butter cups. Reese's peanut butter cups are my favorite Hershey product. My favorite is Milk Chocolate with Almonds. My favorite is Hershey's Kisses with almonds. Hershey's Almond Kisses are my absolute favorite!!! I love Hersheys dark chocolate fun size candies. I like Hershey's Special Dark bars. I love Reese's Peanut Butter Cups! I love Mr Goodbar. Thanks for hosting! My favorite Hershey's is Kisses with Almonds. Reese's peanut butter cups are my favorite Hershey's candy! Thank you! My favorite is Hershey's kisses. I like Hershey with almonds. Thanks for the chance to win! My favorite Hershey's candy is the Hershey's kisses with Coconut cream. I love the Symphany bars with nuts & toffee, but also the dark chocolat bars. I love Hershey Kisses with Almonds. Reeses peanut butter cups.Thanks for the giveaway. REESE's peanut butter cups are my favorite. Mr Goodbars are my favorite. I like Hershey's kisses the best. Hersey's Krackel Miniatures are my favorite. Kisses, seese's cups, hershey bars, all of them! My favorite is the original HERSHEY milk chocolate bar. I love Hershey's White Chocolate and Reese's! Mint kisses--only found at Christmas time as far as I can tell. My fave is the Reese's peanut butter cups. I love Reese's Peanut Butter Cups. My favorite is Hershey's Bar with Almonds. Hershey Kisses are the best. Reese's Pieces are the best! I love all Hersheys candy but my favorite is the milk chocolate bar. :-) Thank you. I love the kisses. Always has. My favorite are Reese's Peanut Butter cups!